Green Ox Pallet Technology has partnered with Edson Packaging Machinery to develop a state-of-the-art pallet assembly machine that will produce J-I-T corrugated paper pallets (approximately four per minute), providing cost savings, improved operational efficiencies, and end-of-line packaging benefits while also solving supply chain challenges surrounding shipping, food/product safety, sterility, sustainability, and more. 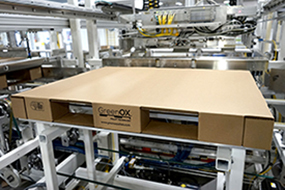 Beginning in late June, 2017, Edson will offer demonstrations showcasing the new machine and its assembly of Green Ox® corrugated pallets at their corporate headquarters in Hamilton, Ontario, Canada. Click here to watch a video of the new machine in action. The new 663 square foot pallet assembly machine will allow you to produce pallets in real time for immediate use in your supply chain. This eliminates the need for storage space for wood pallets and the backhaul logistics and resources involved in tracking them down. And, with the ability to deliver a standard 48×40 pallet or a custom pallet designed to your product specs, you’ll never run out of supply. You’ll also see your fuel and transportation costs go down as our standard 48×40 corrugated pallet weighs less than 15 pounds and is ISPM-15 exempt. Thanks to IKEA®, corrugated pallets are proven. In 2012, they implemented corrugated paper pallets across their worldwide supply chain proving a new operational model that delivered considerable savings—both economically and environmentally. Each year, IKEA and its suppliers utilize some 35 million corrugated pallets globally. Since making the switch to corrugated pallets, IKEA has estimated over $1 billion in savings, proving that a business model centered on corrugated pallets (instead of wood) is both profitable and good for the environment. 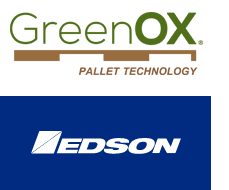 To learn more about the upcoming Open House at Edson’s corporate headquarters and secure your spot to see the demo and learn more about our game-changing corrugated pallet, please click here or on the link below and complete a short interest form and a member of our team will contact you with additional details. *Note your information will remain confidential.